Greater Auburn Gresham community elementary and high schools. Go for the Gold! Represent and tell us what's happening at your school. We want to hear about all the great things happening at your school. The 21st Century Community Learning Centers (21st CCLC) initiative is the only federal funding source dedicated exclusively to afterschool programs. The 21st Century Community Learning Centers (21st CCLC) program is a federally-funded program that provides at-risk students a safe environment during non-school hours. This program may have one or multiple centers/sites which may be located in schools, community facilities, or faith-based facilities. All centers must provide a range of high-quality services to support regular school-day academics and development, including, but not limited to: tutoring and mentoring, academic enrichment (e.g. homework assistance, reading, math, science, and technology programs), service learning, character education, physical education and recreational activities, and dropout prevention. The 21st CCLC program must also engage adult family members in actively participating with students through educational and personal development opportunities. AUBURN GRESHAM — Chance the Rapper, the 2017 Grammy Award winning Chicago-born artist, has set the bar high for what other entertainers should be doing for Chicago Public Schools, one student said. “I thought it was beyond exciting because so many other rappers make millions and [haven’t done] anything, and [Chance] could’ve done the same,” said 13-year-old eighth grader DeShaun Maxwell. “This came from ticket sales, from the fans,” said Chance, who attended CPS schools when he was known as Chancelor Bennett. Although the rapper didn’t attend Westcott for elementary school, he did grow up in the community. Singling the school out meant a lot, DeShaun said, who was present during the news conference. “It was just dope,” he said. Keeping students at school where they’re safe is a plan he supports, he said, expressing concern about the violence in the city. “I don’t want my closest friends to die,” he said. Glendra Williams, 10 and in the fourth grade, said she doubted that Chance would actually come to her school. When she saw him walk into the library, her mouth dropped and she whispered “Oh my god,” she said. “He didn’t just want to give money out and get on the cameras, but he actually wanted to help schools,” she said. Both she and Maxwell called Chance a role model in the community. “He actually really cares about the school, not just Grammys and money,” Williams said. The funding will go toward their after school program that focuses on math and reading, as well as programming such as dance and theater, said school principal Monique Dockery. The call from Chance came Sunday and she said she was very surprised. “He only said he wanted to discuss funding,” she said. Westcott Elementary principal Monique Dockery introduces Chance the Rapper. The $129 million CPS budget deficit — created when Gov. Bruce Rauner vetoed a bill that would have helped the school district pay its pension bill — threatens to force officials to end the school year on June 1 — 20 days early. "Gov. Rauner broke his promise to Chicago's children," Chance said. Chance met with Rauner last week to discuss the budget cuts and how the state could help end the financial crisis that public schools are experiencing. That talk didn’t go well, he said. Over the weekend they spoke again, Chance said, but still no solution was found. "Our kids should not be held hostage," Chance said, adding that he is "frustrated and disappointed" by Rauner's actions, which he said would put Chicago's children "in harm's way" if there is no school during the month of June. Rauner should have signed a bill in November that would have given Chicago's schools $215 million to help pay its bills, said Chance. "Do your job, Gov. Rauner," he said. The governor’s office didn’t respond to Chance’s announcement, but did mention that Rauner and his wife have donated more than $7 million over the last 20 years directly to organizations that benefit CPS students. Chance's donation to Chicago's schools — through the Chicago Public Schools Foundation for Education — will come from the proceeds of his Spring Tour, set to kick off April 24 in San Diego. Chance said he’s hopeful that the crisis won’t last forever. “We are going to get pass this,” Chance said. Rapper and actor Common, also a Chicago native, seems to be on board, Chance said. He texted Chance Monday morning and the two planned to speak over the phone later in the day, he said. Chance said he’s asking for everyone’s help. “When I call on you, I’m going to need your help,” he said. He’s asking for those who are able to donate to Chicago schools. For every $100,000 raised, Social Works Chicago — which Chance co-founded — will donate $10,000. Some from the community gathered outside of the school anxiously waiting to see Chance up close. Although many of them didn’t have children who attend the school, they said they support and applaud Chance for what he is doing. Alicia Timms said more entertainers need to invest in the public schools. “I’m hoping the money he gave CPS actually is allocated to where it needs to go and not to a school on the North Side or someone's pockets,” Timms said. Community resident Joy Lyons said that a lot of Chicagoans are fed up with the city and state government and want to see change immediately. She said it shouldn’t have taken this long for someone like Chance to stand up. Auburn Gresham GOLD Schools Receive Recognition Banners From Network 11 For Great Work Around Attendance! On Wednesday, September 21, 2016, Clara Barton Elementary School Principal August Smith, received a very welcomed gift, from the Chicago Public Schools Network 11 office, for all the hard being done to improve schools attendance. 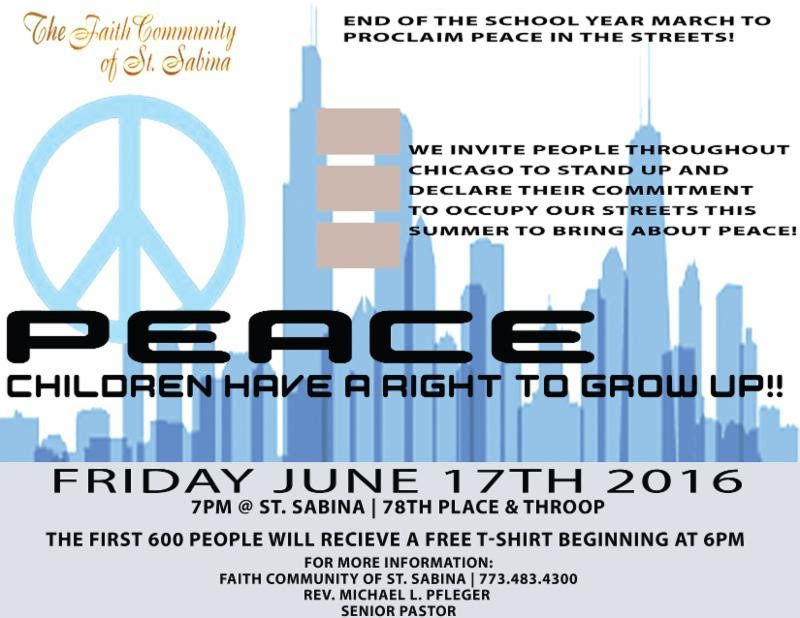 Join Father Michael Pfleger and the Faith Community of Saint Sabina for their Annual Summer Peace March. With Near 70 People Shot Over the Memorial Day Weekend in Chicago, This Peace March May be the Most Important Event of the Year!!! Black Star Will Be in Attendance. Summer Enrichment Registration is Now Open!!! To secure a spot or two, parents must register students. Very low cost for 4-weeks of summer joy! Auburn Gresham GOLD Schools, plan a WALK TO THE HEALTH FAIR ON THE BLOCK! Use this as an motivational event to get our students and families exercising. This outing is a great group activity for classes. Walk to engage Parent Mentors and Local School Councils. See you there! Hi! We are 42 special education majors at Illinois State University who are currently enrolled in Dr. April Mustian’s SED 388 (Sections 1 and 2) course on Classwide and Individualized Behavior Supports. Our class is part of a new course sequence at ISU called INFUSE (Innovative Network of Future Urban Special Educators). As part of INFUSE, we take immersion trips to Chicago and other urban areas in Illinois so that we can learn more about being successful urban special educators. This semester, we are continuing a project to support two schools located in Auburn Gresham. In partnership with the Greater Auburn Gresham Development Corporation (GAGDC), both John G. Cook Elementary and Simeon Career Academy are GOLD schools in GAGDC’s community-driven education plan. We have been working with GAGDC, the Chicago Teacher Education Pipeline (CTEP) at ISU, and our professor, Dr. M., to continue a mentorship through afterschool programming, called ROYAL (Revolution of Young Artists as Leaders), between Simeon and Cook students. The students at Simeon are bringing their SLAM poetry skills to Cook in order to help younger kids develop their leadership skills through spoken word just as the Simeon students have successfully done. Slam poetry has become a way for students to find their voices, talk about their dreams, struggles, and personal experiences, and to be heard amongst their peers and the community. We plan to also utilize money raised to support funding of the award-winning "Writers Never Die" Slam team at Simeon because we have seen much success among the students! We want to help ensure they have the proper funding to take part in competitions and perhaps provide more workshops to younger students like those at Cook through this new ROYAL mentorship! We also want to continue supporting Cook Elementary, as funding for after-school programming is limited. Please help us support our future leaders in Auburn Gresham! They deserve it! Click on the link or picture below to help our youth! Calling All Schools, Save the Date for "HEALTH FAIR ON THE BLOCK"
Come enjoy a Family Movie and Free popcorn for all! Auburn Gresham GOLD (AG GOLD) held their first Family Game Night at Oliver Westcott Elementary School, 409 W. 80th Street, Thursday evening October 30, 2014. Students came out with their parents for a night of games, food and community fun. As Westcott Principal, Monique Dockery was in attendance along with her staff and administration, Westcott’s first game night was a huge success. This game night not only gave Westcott an opportunity to come together as a community but also allowed Auburn Gresham GOLD to introduce their new parent resources room inside the school. Stay tuned for look at the slideshow from this exciting inaugural two generation event! Auburn Gresham GOLD was proud to announce the job training program they plan to offer to parents this year. CVS and Auburn Gresham GOLD are teaming up to provide parents with free job training to become certified Pharmacy Technicians and encourage parents in their journeys in obtaining new and solid career paths. Calling all Auburn Gresham Schools! Plan your first outing, for the "Auburn Gresham Health Fair on the Block." This bi-annual event is a gem for the community and our schools. Come participate in exercise for youth, cooking demonstrations and participate in health related activities that impact and help improve our commmunities. September 25th from 10:00am to 2:00pm, on the street between Racine and May, sponsored by our CVS Caremark.